Our New Read-a-thon Photo Showcase is the perfect way to not only increase participation but to dramatically increase the amount of money you raise. We will send participating families two FREE 5 x 7 photos of their child participating in your Read-a-thon for simply activating their page and sharing it with five friends and family members. There’s no cost to the family or the school. Call us at (866) 888-5155 for more details. If your goal is to have students read more and raise more money for your school or library then consider our new Instant Rewards prize program. The program allows you to build a custom reward or prize sheet that offers incentives to readers who activate their Read-a-thon personal page, reach different reading goals and raise different amounts. 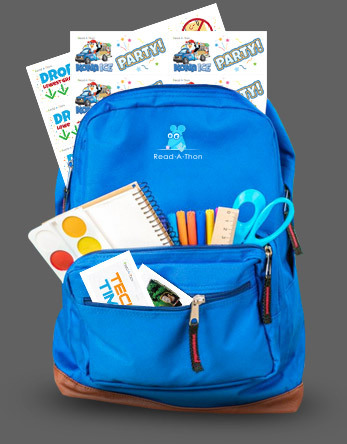 We will send those prizes to your school along with your starter kit so you can distribute rewards on a daily basis in the classroom. 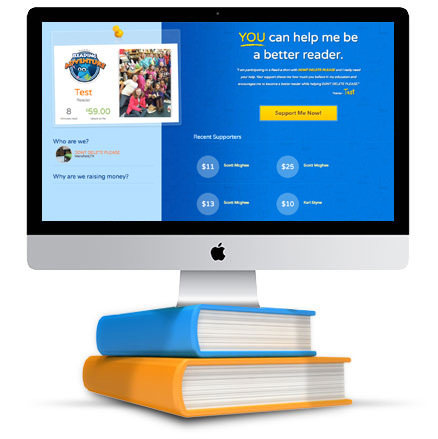 The instant rewards program makes your Read-a-thon more of an event that will keep your students more excited about reading and raising money. And there’s still no cost to start your Read-a-thon. Simply choose Instant Rewards during the sign up process. What if you could raise the money your school needs by focusing on reading instead of selling over priced fundraising products? Now you can. Running a Read-a-thon through your school, group, or parent organization is free to start, raises a ton of money, and requires little to no volunteers. It really is the most rewarding fundraiser ever. "We LOVED this fundraiser! After one bad experience after another with the traditional fundraisers. We decided to try Read-a-thon. What a true pleasure it was from start to finish. The parents, teachers and even the students loved it. It was our best school wide fundraiser to date and raised nearly $20,000.00. We will never go back to the traditional fundraiser again! " See how much you could raise. Kristina with Sonoran Sky Elementary shares why Read-a-thon was so much more than just a fundraiser. Their original goal was to raise $20,000. They nearly tripled their goal and Christina now strongly believes this is the fundraiser every school in America will be using. Sonoran Sky considered a Fun Run but decided there was really no comparison because of the educational element to Read-a-thon. "Always work hard my love!!!!!!" "We are so proud of you for being an awesome reader!!!" "Hey Maleaha! Pepaw and Grammy are so proud of you for wanting to read during your Spring Break! We know you will make your goal because you are a very smart girl! Happy reading! We ❤️ you!" "Great Job reading my Son!!! Keep it up!!!" "I love that you love to read! " "Go Lily!! I’m proud of you!" Your students are already doing it. All your readers have to do is read for 30 minutes a day for 10 days. The hardest part is deciding to get started. From there we provide everything you need for your read-a-thon. Our system was designed for kids. It's fun, encourages participation and even includes prizes and rewards. There is no better way for a school, school group or group of school aged kids to raise money than a Read-a-thon. Why? Because family, friends and neighbors understand how important education and reading skills are. When asked most people will make generous donations to encourage a child to read. Very few fundraising ideas offer such clear benefits to children and the groups they are raising money for. We provide a complete read-a-thon system. We help your readers get the most sponsors possible with print materials, email campaigns and social media tool. We provide a prize center as an incentive for readers to get as many sponsors as possible. We collect all payments so children are not handling money. We send daily report cards to readers and administrators showing current results along with suggestions on what actions should be done to maximize the effectiveness of your read-a-thon. Our read-a-thons consist of 10 reading sessions. Each session is 30 minutes long. Readers can read in class as a group or they can hold their own reading sessions. Once your read-a-thon is set up you click on Start a Reading Session and start your 30 minute timer. If you're reading in class everyone in attendance is given credit for that session. Currently Holding a Book Fair or a Product Fundraiser? Does your school currently hold a Fun Run or Boosterthon? Click Here to hear why Read-a-thon might be a better option. © 2019 Read-A-Thon Fundraising Company Inc. All rights reserved. All Content and materials on Read-A-Thon.com are the property of Read-A-Thon Fundraising Company Inc.
Read-A-Thon® is a trademark of Read-A-Thon Fundraising Company Inc.